You can register a Sender ID or so-called Alphanumeric Sender Name, e.g. company/brand name, by filling in a form in the contact information section. Go to Settings > Sender Information section and look for “SMS Sender Information” subsection. Click on the link that says “Add SMS Sender”. 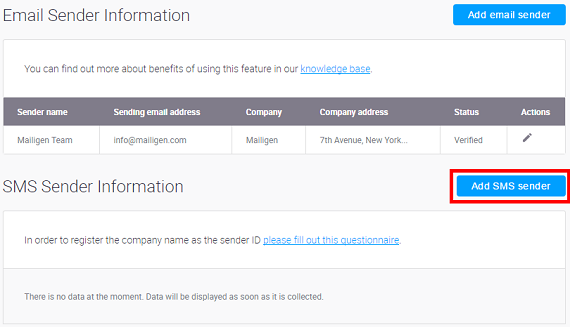 A new window will open where you can fill in information to register your company Sender ID. * Remember only company name or brand name can be registered as a Sender ID. ** The Sender ID feature only applies to network operators who support this feature. For example, you cannot use custom Sender IDs when delivering messages to the United States of America or Canada due to certain limitations with USA and CAN network operators. The messages might be delivered from randomly assigned number instead of the alternative number you provided when requesting Sender ID.